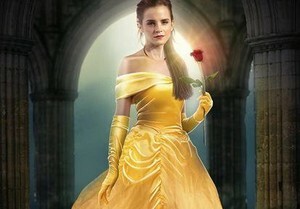 Emma Watson as Belle. . Wallpaper and background images in the Emma Watson club tagged: photo emma watson belle. This Emma Watson photo contains japon, jurk, bruidsjurk, trouwjurk, bruids jurk, wedding gown, wedding dress, diner jurk, diner toga, formele, avondjurk, formeel, and diner-jurk. There might also be bruidsmeisje, toga, robe, gown, jurk, mantel, formele kleding, avondkleding, formalwear, avondjurk, and avond kleding.